New Report Dissects "Boondoggle Map"
Usually, we ignore the misinformation released by the Taxpayers Protection Alliance (TPA) but their latest efforts are so shady, we felt it was our responsibility to shine a light on its lack of validity and the organization's credibility. Our report, Correcting Community Fiber Fallacies: Taxpayers Protection Alliance Edition, takes a deeper look at the TAP's most recent attempt, which is filled with errors and a blatant disregard for the truth. What Is A "Boondoggle" Anyway? This Map! When we looked deeper, we discovered that TPA’s "Broadband Boondoggles: A Map of Failed Taxpayer-Funded Networks" is more misinformation than map. All of the basic errors in the map display a lack of attention to detail; our short report examines the deceitful characteristics of this resource. Our purpose in publishing this report is to caution community leaders and citizens who are investigating publicly owned infrastructure; the TPA is not a credible source. One of the more obvious errors: Sandy, Oregon, appears in Utah. The map is also visually deceiving because it includes 213 communities, but only provides information for 87. Of the 213 on the map, the TPA only label 14 as "failures," which means less than 10 percent of the networks they document fit their own definition of "failure." Clearly, TPA has proven that it seeks to spread any and all information it can find to discredit municipal networks, regardless of accuracy. Communities, public officials, or staff that research the option of publicly owned networks should review our report if they have ever considered the data in the Boondoggles Map. If your community is seeking better connectivity, thorough research will be the foundation of how you proceed. As part of your research, be sure to review the organizations that offer information. When communities decide to proceed with publicly owned infrastructure, they often aim for open access models. Open access allows more than one service provider to offer services via the same infrastructure. The desire is to increase competition, which will lower prices, improve services, and encourage innovation. It seems straight forward, but open access can be more complex than one might expect. In addition to varying models, there are special challenges and financing considerations that communities need to consider. In order to centralize our information on open access, we’ve created the new Open Access Networks resource page. We’ve gathered together some of our best reference material, including links to previous MuniNetworks.org stories, articles from other resources, relevant Community Broadband Bits podcast episodes, case studies, helpful illustrations, and more. Check it out and share the link. Bookmark it! Danville, Virginia, has long been one of the municipal network approaches that we like to highlight. Built in a region hard hit by the transition away from tobacco and manufacturing economies, the open access fiber network called nDanville has led to many new employers coming to town and has shown the benefits of a low-risk, incremental investment strategy for building a fiber network. Jason Grey, Interim Utilities Manager, is back on the show to update us on their approach. He introduced the network to us three years ago on episode 22. Since we last checked in, Danville has continued expanding the fiber network to a greater number of residents and Jason talks with us about the importance and challenges of marketing to residents. We also discuss how they lay conduit as a matter of course, even in areas they do not plan to serve immediately with the fiber network. Read all of our coverage of Danville here. When we last wrote about the Mid-Atlantic Broadband Cooperative, it was a coop focused on open access middle mile connections. Now it has become the Mid-Atlantic Broadband Communities Corporation and is starting to work on some plans to expand open access last mile access. This week, we speak with MBC President and CEO Tad Deriso to learn more about their history and current approach. We discuss how they got started financially and lessons for other middle mile open access efforts. We also discuss their plan to expand the model to last mile businesses and homes in Martinsville in southern Virginia. And along the way, we learn how incumbent providers react differently to open access in the middle mile than in the last mile. To finalize our series on reflections from Seattle and Gigabit Squared, I discuss open access networks and how the requirement that a network directly pay all its costs effectively dooms it in the U.S. Read part one here and part two here. I started this series because I felt that the Gigabit Squared failure in Seattle revealed some important truths that can be glossed over in our rush to expand access to fast, affordable, and reliable Internet connections. The benefits of public-private-partnerships in these networks have often been overstated while the risks and challenges have been understated. We have seen them work and believe communities should continue to seek them where appropriate, but they should not be rushed into because they are less controversial than other solutions. Sometimes we have to stop and remember that we will live for decades with the choices we make now. It was true when communities starting building their own electrical networks and is still true today. I hope the series has provided some context of how challenging it can be without removing all hope that we can stop Comcast, AT&T, and others from monopolizing our access to the Internet. In this final piece, I want to turn to a different form of partnership - the open access network. I think it follows naturally as many in Seattle and other large cities would be more likely to invest in publicly owned fiber networks if they did not have to offer services - that being the most competitive, entreprenuerial, and difficult aspect of modern fiber networks. The desire to focus on long term investments rather than rapidly evolving services is a natural reaction given the historic role of local governments in long term infrastructure investments. Fiber certainly fits in that description and as many have noted, the comparison to roads is apt. An open access fiber network allows many businesses to reach end users just as roads allow Fedex, UPS, and even the Post Office, to compete on a level playing field. Danville's open access network has fueled economic development in the Virginia community's resurgence after tobacco’s demise and job losses from a once thriving textile industry put a hurt on the local economy. Danville’s technological prowess is now attracting companies from China, in addition to other economic development gains we covered previously. Jason Grey, nDanville’s Network Manager, told us that Zeyuan Flooring International, a Chinese wood floor manufacturer, is locating its first U.S. facility in Danville. Zeyuan CEO, Sindy Cui, said the company initially thought about locating in Los Angeles, but was eventually swayed by the hospitality and resources available in Danville. Zeyuan plans to invest $15-million in a 40,000 square foot manufacturing plant that will employ 100 people within three years. Zeyuan is the second Chinese company to locate in Danville in the past year. Last September, Chinese furniture assembler GOK International announced it will invest $12.5-million to establish its U.S. headquarters and showroom in Danville. GOK International plans to employ 300 people within three years. Not coincidentally, both companies are locating in Cane Creek Centre, one of Danville’s five industrial parks connected to nDanville’s fiber network. Serving businesses was a high priority in building the network. As the first fully automated open-access network in the country, nDanville passes more than 1,000 businesses including every parcel in each of the industrial parks. Many businesses take 100-Mbps fiber connections, some take advantage of 1-Gbps connections. These recent additions to Danville’s thriving commercial sector are just the latest in a steady string of economic development successes for the area that include the likes of Goodyear and IKEA. And it’s not just manufacturing. 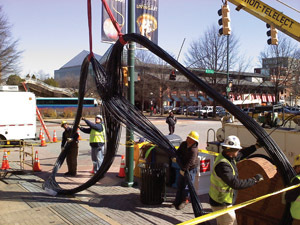 The Economic Development Conference Series' first event, Community Fiber Networks, is scheduled for November 8 - 9, 2012, in Danville, Virginia. Dates and locations for later events will follow. The series is being produced by Broadband Communities Magazine. Danville is near the border with North Carolina. Christopher Mitchell and a long list of industry experts will be presenting on a wide range of topics at the Institute for Advanced Learning and Research in Danville. Leaders in all areas of the Advanced Broadband Network industry will be sharing their findings and expertise. Danville was chosen because it is a true success story. By using their fiber network as a catalyst for economic development, Danville transformed itself. For years it was a struggling textile town but is now a highly desirable destination for businesses and individuals seeking advanced telecommunications services. Christopher will be talking on Thursday, November 8th, on "Winning Community Initiatives." Friday, November 9th, he will present as part of the panel on "Innovative Financing Methods." The full agenda for the conference is available to help you plan your schedule. THIS IS THE FIRST conference of its kind in this country - an event devoted entirely to the relationship between a community's economic vitality and the presence of advanced broadband networks. Nations around the world have recognized this powerful linkage and responded to it - as have a growing number of communities in the United States. Each event in this new conference series will be held in a city with an advanced broadband system. Each event will have an impressive array of speakers whose mission will be to help attendees evaluate the options and opportunities and develop the optimal, affordable solution for their communities.